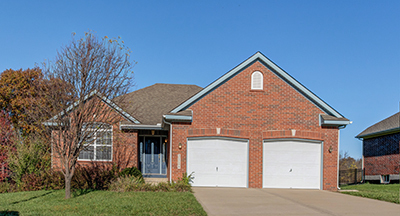 One-Level Living in JoCo KS -- see all homes for sale! Deb Staley of RE/MAX Realty Suburban specializes in helping people find homes on one level in JoCo KS. Her website, Deb Dot House, is optimized with special searches to help you find one-level homes, or at least a home with a master bedroom on the main level. This page brings together all of those Web pages so you can easily find just the right home. Most villas and patio homes (they are the same thing) have a ranch floor plan, 1.5-story, or 1.5-story reverse floor plan. Some townhomes are on one level, but not many. This link shows you townhomes with a ranch floor plan, a 1.5-story floor plan, or a reverse 1.5-story floor plan. True ranch homes are very popular. All ranch homes for sale in JoCo KS can be found here. If you have a specific city in mind, use the menu items above to find ranch homes in Lenexa, Olathe, Overland Park, and Shawnee. Deb is a Seniors Real Estate Specialist, and many senior citizens (including Deb) want or need a house on one level. It can be a challenge to find just the right one, so let Deb help you with it. She does not charge any fees to be your buyer’s agent!